We provide financial and community service support to these and other programs. Club members and youth from the three local high school Key Clubs volunteer thousands of hours to assist with projects to serve the agencies listed above. These community projects have established The Kiwanis Club of Vero-Treasure Coast as a premier provider for children’s needs. Our club raises money for children’s needs through golf tournaments, special projects, and business and private donations. Special grants are also available through Kiwanis International. family and guests. These include events at the holidays, barbeques, special dinners and receptions, and other activities to promote fun and fellowship. Kiwanis Aktion Club of Indian River County is the world's LARGEST Aktion Club! In 1980 Greg Holtan was one of the founding members of what is today the largest Kiwanis Aktion Club in the world. At that time there were 33 members; today there are nearly 150. 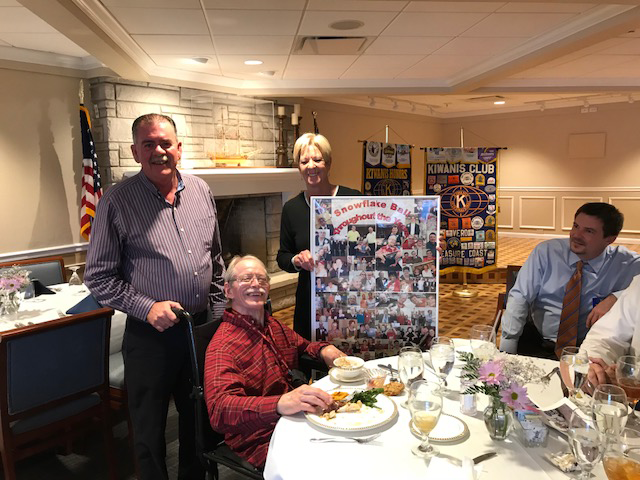 The mission of Kiwanis Aktion Clubs is to provide opportunities for physically or mentally challenged adults to interact with the public and to socialize. Greg says that its most important goal is "to have fun". • Annual participation in "Special Olympics"
KIWANIS KEY PERSON AWARD 2016 – Congratulations to Michael Cairns (left) named Kiwanis Key Person of the Year. The award is presented by Robi Robinson, Kiwanis President. Congratulations to Richard Schlitt (left) named Kiwanian of the Year. or retired business and professionals that reside, conduct their business, or have other community interests in Indian River County, Florida. You may contact a club member or simply attend a meeting as our guest with no obligation to join. This provides you the opportunity to meet members and learn more about our club. If interested in joining, the club provides you a member that serves as your sponsor. Kiwanis International membership application fee of $85. The membership chair will explain quarterly assessments. On Saturday Oct. 18 Kiwanis Club of Vero/Treasure Coast built a handicapped ramp for the new education building at the Homeless Family Center (HFC). Following plans done by local architect and Kiwanian Staffan Lundberg seven Kiwanians dug post holes and set up the underlying structure for the ramp. Kiwanian Jim Clemens who is head of facilities at HFC assisted Lundberg in leading the building crew. Other Kiwanians who assisted were Jim Wolfe, Kevin Brown, Robi Robinson, Craig Homer, Beckett Homer and friend of Kiwanis George Fetterolf. From L to R - George Fetterolf, Staffan Lundberg, Jim Clemens, Beckett Homer & Craig Homer take a break from construction. Kiwanians setting posts for the ramp. View of ramp with underlying structure completed. Bob Marshbanks, Secretary, Jim Vensel, Lt. Governor, and Ginny Benton, Kiwanis President. On Saturday March 7, 2015 nearly forty teenagers and fifteen adult volunteers helped repair and paint houses for families that could not afford or were unable to do these jobs. At 8am the youth met and were divided into teams and assigned to their jobs. Under the supervision of Youth in Action (YIA) co-founders Richard Schlitt and Al Sammartino they worked for four hours, and then were treated to lunch by the Vero/Treasure Coast Kiwanis Club. For more than 15 years YIA has completed service projects four times per year. In addition to the Vero Kiwanis Club sponsors include; Our Savior Lutheran Church, Community Church of Vero Beach and St. Helen’s and Holy Cross Catholic Churches. Kurt Allerman, former All-American linebacker at Penn State University and NFL player with the Detroit Lions, St. Louis Cardinals, and Green Bay Packers spoke to Kiwanis members on Wednesday, September 16, 2016. Photo shows some of the teens getting ready to work. On Saturday January 23, 2016 35 high school Key Club members joined Vero Kiwanis Club volunteers to clean-up more than six miles of Vero's beach. The volunteers were from the Key Clubs at Vero Beach HS, The Indian River County Charter HS and St. Edward's Upper School. After three hours 40 bags of trash were picked up from the beach. This service project was led by Vero Kiwanians Al Sammartino, Robi Robinson, Michael Cairns, Stephan Lundberg and Herb Hinkle. Vero Kiwanis also provided snacks and lunch for the volunteers. Kiwanis was honored to have Chris Avery (left) speak on February 17th about his distinguished career in the United States Marine Corps and Army National Guard. Chris had two tours of duty in Iraq. He also flies vintage WWII Corsair planes and is a commercial airline pilot. Chris is the owner and lead instructor for Gunner Tactical. Pictured with Chris is Kiwanis member George Fetterolf, a Vietnam veteran. from The Kiwanis Club in West Seneca, New York. featured in the Press Journal. When it comes to outreach, the Kiwanis Youth in Action are always willing to go the extra mile. It’s no secret, members of the club are passionate about giving back, collaborating, and working together for the greater good. Recently, more than 20 volunteers came out to the Women’s Refuge of Vero Beach to help paint the office building and landscape shed as well as pressure wash.
“It’s pretty amazing to look at the property and see everyone smiling. The painters were conscientious of doing a good job, and they did. Most people love the new color because it looks like the ‘sunshine house,’ which we’ve always called it for years,” said organization’s Groundskeeper Sue Sargent. The volunteers come through a partnership with the Kiwanis Club Youth in Action, Richard Schlitt of Schlitt Brothers Inc., Key Clubs from the Vero Beach High School and Charter High School; local church teen groups from Community Church, Saint Helen’s, Holy Cross, and Christ by the Sea. “We do this type of service work a few times a year, including a beach and island clean up. On any given workday, we usually have more than 70 teenagers spread out throughout the county. For some of these kids, it is their first time volunteering. It truly opens their eyes to the real need in our community,” said Kiwanis Club Board Member Al Sammartino. Al Sammartino and Tom Maher recently received a $3000 check from Dyer Auto for the Kiwanis Youth in Action Program. Special thanks to Dyer for their continued support for Kiwanis and the youth of Indian River County.